Wifestyles Blog & Photography: Can't stop my shine! My entire life I've always been happy. When I was a little girl my favorite song was, "You Are My Sunshine." I used to make my mom and grandma sing it to me constantly. Now that I'm older I see it crystal clear. Tuesday night my blog got a lot of "negative" reviews, so to say. However it's a sad situation, when the "mean critics" used to be your "friends." So, I apologize now to any of you that follow me on twitter and had to see all the unnecessary drama that occurred. 1. Not everyone can be happy for you. 2. There will be times in life that you get knocked down, but you have to get right back up. 3. The Lord doesn't give you anything that you can't handle. 4. Sometimes life gives you lemons, but you can choose to use the lemons to make lemonade. "If someone is trying to rain on your parade.. it's because they are jealous of your sun and tired of their shade." Love that quote at the end too and LOVE your blog! I'm sorry about the negativity! BOO to those people. I'll never understand why some people choose to be like that. So glad that you are looking on the bright side! GOOD FOR YOU GIRL! great attitude! no one can stop your shine unless you let them! Oh snap! That last quote hits where it hurts. Good for you for sticking to your guns and believing in yourself. It's a wonderful quality! Don't worry aobut it.. this is your blog.. i would just hit delete and never think another thing about it. Your cute as pit and just as sweet!! so don't worry!! Ugh, I have a feeling that those "haters" will unfortunately be there our whole lives. I've had to deal with this a lot and I don't understand why people are so cruel! I love your attitude and couldn't agree more! Why the heck would people be mean!? aww don't let it get you down, you are a happy person and that shines through. Keep up the positive outlook! Thanks for sharing this post!!! Keep on the positive side~ So many people love and adore you! I enjoy your blog! Don't ever get down about what other people have to say...they are most likely miserable in their own life, so they pick on yours! You are beautiful inside and out!! Love this!! Being happy is a choice! Love your blog. Following now! So sorry to hear that! The only thing that you can do is keep on shining, they are obviously just jealous. Recently I was receiving some hateful/jealous comments on my blog and I decided to stop allowing anonymous comments on my blog! You just need to cut out the negative people and don't let them bring you down! Thanks for guest posting about our wedding on my blog this week! I loved your post! You are so right on happy girls are the prettiest! I wish every girl out there lived by that motto. This is funny because I just dealt with the same thing last weekend! It is crazy I tell ya, crazy! Glad to see you are handling it gracefully and keeping your head up! You Are My Sunshine was (and is) my favorite song too! My mom sang it to me when I was little and now I sing it to my kiddos. 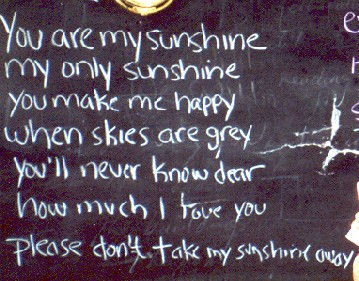 I even have a sign in my daughter's room that says "you are my sunshine". I love it! I just found your blog and it's lovely. Please visit my blog too if you get a chance.